Right Ho, Jeeves is the perfect book to read if you are feeling slightly dispirited. It is a rollicking, barrel of laughs from start to finish and is sure to put a smile on your face. If, like me you love the TV series, you’ll find the books just as entertaining. The book is bursting with farcical situations, foolish schemes and some very amusing dialogue between our two favourite characters Bertram Wooster and his butler, Jeeves. Starting with the simple problem of Gussie Fink-Nottle being too nervous to admit his love for Madeline Bassett, Bertie creates a whole confusing mess of matters and causes chaos at his Aunt’s house. Luckily, Jeeves is always around to save the day with a well thought out plan and knowing smile. I absolutely loved watching Stephen Fry and Hugh Laurie in their version of Jeeves and Wooster, they had such good chemistry. Similarly in the book, the interaction between Wooster and his butler are incredibly funny. Bertie is constantly irritated by Jeeves’ “Indeed, sir”s and “very good, sir”s and his ability to lose or ruin his favourite (and awful) new ‘fashionable’ clothes. But what would Bertie do without Jeeves and his wonderful pick-me-ups after a night on the town? I must not forget the other characters, who really bring the book to life. Aunt Dahlia, in comparison to Bertie’s silly, slow witted character, is sharp and snappy. Her fury at Bertie for bad ideas and uselessness brings out some funny insults and had me laughing out loud. The newt loving Fink-Nottle’s pathetic attempts to woo Madeline Bassett lead to some hilarious scenes and the food loving Tuppy Glossop’s violent rampage was very enjoyable to read. Right Ho, Jeeves is an easy book to get into, filled with many funny incidents and silly characters. I’m sure my bookshelf will shortly display many more of the series. I can’t wait to read more about Wooster’s world and meet more of his fascinating friends! If you like the sound of it, buy the book by clicking on the picture below. I haven’t read Right Ho, Jeeves yet but would love to! I read Very Good, Jeeves and The Inimitable Jeeves and loved them! I couldn’t agree more! Even though I was too young during the original run of the show I fell in love with it through re-runs. Stephen Fry and Hugh Laurie were perfectly cast in their roles. They really were perfectly cast. I can’t think of anyone else who could do it better! I also didn’t watch them when I was younger. In fact, I think I only saw it for the first time a couple of years ago! I think it must be about time to get hold of another one of the books now! Over 100? Wow, I should really get started on them! Thanks for the comment! I have a fantastic collection of his short stories which make fantastic pick-me-ups when I’m down in the dumps. His writing definitely is made for pick-me-ups! Oh! 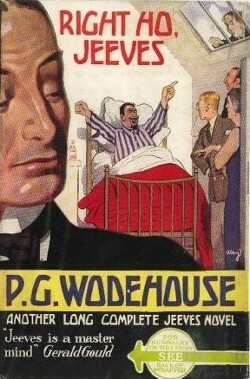 P.G.Wodehouse is such a treasure! I made it a point to keep some of his books always by my side. Yes, I’ll have to read more of his books now I’ve discovered him!